We unloaded a glaze firing this evening and found nice consistent results. The witness cones showed we were just a hair off the target temperature, though everything finished fine. I’ve posted a few preliminary pictures on Flickr. A complete set will be coming soon. I plan to participate in the Farmer’s Market the evening of November 2, which in Kinston is Holly Day! 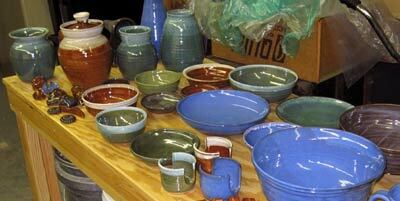 We’ll be there from about 5 to 8pm, with much of the new pottery available for sale. I hope you’ll come out for the Holly Day Celebration, and stop by the Farmer’s Market to say hi. Must be fun to crack the lid and peek inside! The light blue items look wonderful, and the ringed items are sweet. Glad you are having fun and making such cool pieces! Is the big blue bowl glazed in the indgo float? It’s really beauitful. Jody, the bright blue pieces in the picture are indigo float, Amaco PC-23. It’s been pretty consistent in results for me at cone 5 and 6.